After the LHC restarted beam operations last week the physicists had at least one pleasant surprise. An unknown source of interference dubbed The Hump that had plagued the collider since December 2009 has vanished over the winter shutdown. The reason for its disappearance is as mysterious as its former existence. Nobody knows where it went or whether it will come back. This is good news because the Hump had been quite a nuisance for the beam operators. When it was around it could destabilize the beam leading to diminished luminosity, or even an unwanted beam dump. Its failed appearance this year will help with the maximum collection of physics data. Already the process of setting up the beam parameters for this year is well under way with the machine performing as well as it did last year. This year they want to increase the luminosity and that will require a tighter squeeze of the beams at the intersection points where the protons collide inside the detector experiments. Last year the squeeze was taken down to a beta* of 3.5m but this year they want to get it down to 1.5m. In plane terms that means an improvement by a factor of 3.5/1.5 in the amount of physics data that they can collect. The squeeze is a delicate process performed in a gradual reduction of beta*. The LHC is designed to ultimately reach a squeeze of 0.55m but that will only be possible at the design energy of 7TeV per proton. At the current operating energy of 3.5TeV per proton getting down to 1.5m is quite a challenge. In the first attempts last week the beams were lost at just below 2m. Another go at getting to 1.5m is planned for today. Update: Rumours of the humps disappearance were premature. It suddenly switched back on. Looks like the time travelers had it switched off during the shutdown to minimise the chances of the source being discovered, but they were just a little slow turning it back on again. Must be a traffic jam in the wormhole. Update (28 Feb 2011): The squeeze to 1.5m was successfully carried out on Saturday afternoon. We have been following the story of the mysterious Hump at the LHC here on viXra Log, so it is nice to see that Steve Myers will have something to say about it at his ICHEP talk tomorrow. 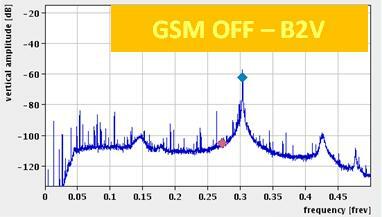 The Hump at the LHC is not GSM interference. If you have been following our LHC news features for a little while you will know that the Large Hadron Collider has been dogged by a particularly annoying form of interference that the beam engineers have dubbed “The Hump“. Yesterday they ran some tests to see if the source could be the GSM phone network that they run throughout CERN. By switching off the GSM transmitters while a 450 GeV beam circulated in the collider ring they were able to show that the interference did not go away. Something else must be to blame. The Hump takes the form of a hump in the spectrum of beam oscillations that drifts up and down the frequency range. The beam is normally given a tune frequency away from any interference to keep it stable, but because the hump frequency keeps changing it is difficult to avoid whatever tune frequency is chosen. When the hump drifts over the beam frequency it destabilised the beam causing it to spread out vertically. The first effect of this is to decrease luminosity because as the protons spread out they are less likely to collide, then as the beam spreads out further the protons hit the collimator causing losses that reduce the lifetime of the beams. In the worst case the losses can trigger an unwanted dump of the beams. The LHC has a number of inbuilt dampers and other features that help to stabilise the beams by steering wayward protons back into the centre of the beam, but at high intensities these don’t seem to be quite enough to avoid the effects of The Hump. It has been around since the LHC was restarted at the end of the year and has thwarted all attempts to track down its cause. The history of collider building provides several stories of interference that was hard to track down in the past. 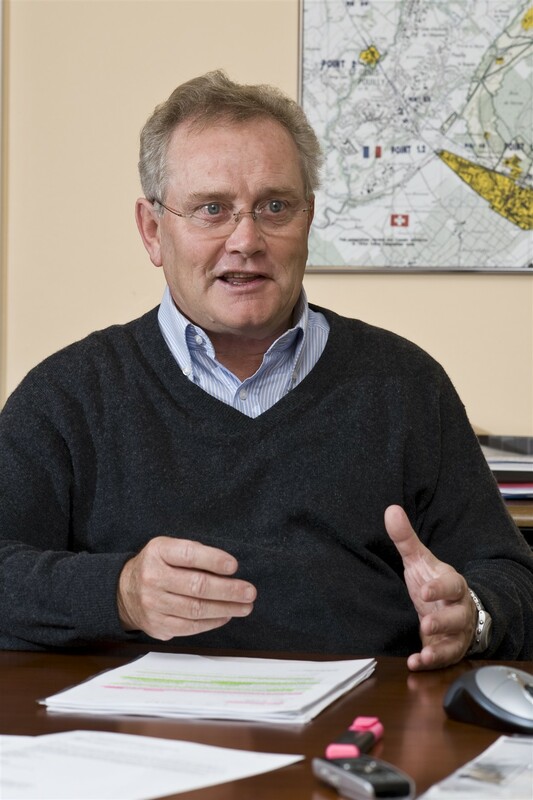 When LEP was running at CERN another nasty problem was finally diagnosed when the French rail workers went on strike and the interference disappeared. It had been caused by a nearby TGV line. 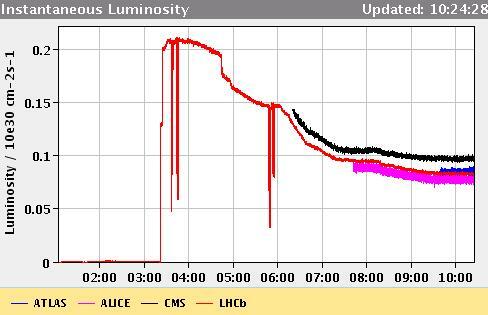 For the last few months the LHC beam teams have been looking for causes of The Hump and yesterday’s GSM test is the latest in a series that have eliminated many possible causes such as vacuum pumps, and Cryogenic coolers, bur whatever they do the hump remains. Meanwhile we can look forward to the LHC engineers testing for even less likely sources for The Hump and hope it does not have too bad an effect on the continuing build-up of luminosity. In my previous LHC report I wrote about how the LHC was then running with a beam configuration of 13 bunches each holding 20 billion protons squeezed to 2m, providing a luminosity of 2 x 1029 Hz/cm2. This took them up to the limit of what is regarded as safe levels for the LHC. As they move towards more total energy stored in the beam, the risk of damaging sensitive parts of the collider if the beam goes astray gets higher. As it happens, it is possible to get higher luminosity without increasing the stored energy by putting more protons in each bunch but having less bunches. A couple of weeks ago the plan was to carry out tests to get these high intensity bunches stabilised. These tests would be interspersed with physics runs using the 13 bunch setup. As this got underway the LHC was hit by a power cut that knocked loads of its systems out. If you have ever had trouble getting your PC back up after a power failure you can imagine what it must have been like for the LHC engineers with multiple components to get back into working order. The hardest of all were the cryogenic systems and in the end it took over a week before beams were again circulating. Last week there was a conference in Hamburg to report “Physics at the LHC” (pLHC). Of course there is nothing revolutionary to report yet but it was a chance for the detector collaborations to report on the data they had taken so far and look forward to what they may see soon as luminosity goes up. A few of the physicists were not too shy to use the opportunity to plead with Steve Meyers for more physics runs before the next big conference so that they have more exciting material to present. That conference will be ICHEP 2010 which kicks off on 22 July so there is not long to prepare. This makes quite a dilemma for Meyers and his team who control the running of the LHC. They could spend a month running with the working 13 bunch configuration, but that would be time wasted in the long run because once the LHC is up to full luminosities the same data will be provided in a run of a few minutes. It is much better to concentrate on getting to higher luminosities sooner but currently the higher intensity beams are not sufficiently stable. As well as The Hump which I wrote about last time, the beams are suffering from instabilities of a type previously seen at the HERA accelerator in Hamburg and dubbed “batman Instabilities”. Luckily, experience from HERA was taken into account when building the LHC and it has better systems including octupole magnets that can be used to cure these problems. On Wednesday a new plan was formed to meet the challenge. There it was decided to abandon the 13 bunch config for physics and concentrate on commissioning the higher intensity bunches. This is because the process of switching between the two operation modes was causing too many delays. With some optimism they hope to have the higher intensity bunches in good shape within two weeks so that physics runs can restart at higher luminosities. If they succeed the lost time will be quickly made up and there will be plenty of physics runs in time for ICHEP 2010. If they fall behind schedule the physicists may turn up at ICHEP with little more than they had at pLHC. In truth there was no contest, the long-term goals take priority. If they miss out at ICHEP there are other conferences to follow. Patience will eventually pay-off. So according to this new plan they will be able to restart physics runs by the end of June with nominal bunch intensities of about 110 billion protons, thus providing plenty of collisions just in time for ICHEP. The lower intensity bunches were being squeezed to beta=2m, but this process is harder at higher intensities and they had planned to aim for just 5m. After much scribbling on white boards (no doubt) they have now decided that they can get to beta=3.5m, which is better. From that point they aim to step up the number of bunches again and are hoping to be circulating 20 to 40 bunches per beam by August. They will then stick at that configuration to provide a month of physics runs. Obviously this plan allows for the fact that the French all go on holiday during the whole month of August so everything will have to run on autopilot during that time anyway. When everyone gets back they can continue stepping up the luminosity with more bunches. What news then of the mysterious and malignant Hump? They did some further tests last week to see if The Hump was being caused by the cryogenic systems. The result was: no it isn’t. I think the hope now is that as they bring better stability systems into play (such as the transverse damper), The Hump will then be less of a problem even if the source for it is never found. We shall see. Is someone trying to sabotage the Large Hadron Collider? This morning the Large Hadron Collider set yet another record as it injected 13 proton bunches in each beam to reach a luminosity of 2 x 1029 cm-2 s-1, about three times previous records. The next step will probably be to increase the intensity of the bunches from 20 billion protons in each bunch up to the nominal design limit of 120 billion. With such high bunch intensities the beam controllers must take extra care. If the beam becomes unstable the protons can go astray and plough into the sensitive particle detectors causing damage to the instruments. If instabilities grow the beams must be dumped quickly before all control is lost. This is why the gradual increase in luminosities has been a slow process. Since they started up the LHC at the end of last year the physicists have been dogged by a mysterious source of interference christened “The Hump”. 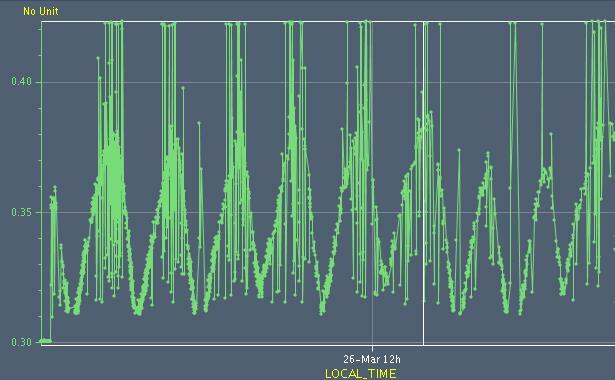 Some unknown vibration is causing an extra vertical oscillation in the beams. The movement is very tiny, just microns in magnitude, but when its frequency hits the tune frequency of the beam it resonates and the protons start to spread out from the beam vertically, causing beam losses. So far this has been just a nuisance decreasing the lifetimes of the beams and sometimes triggering an emergency dump, but as beam intensities increase it becomes a bigger threat and could lead to damage of the accelerator. Over the past few months the engineers have been trying to trace the source of the interference, but without success. Accelerators are very sensitive to any kind of movement. The previous accelerator at CERN, known as LEP was affected by the tidal pull of the moon and by the passing of France’s high-speed train, the TGV. Recently the Tevatron in the US detected the devastating Earthquake in Haiti thousands of miles away when it caused a small wobble in the beams. But The Hump is different. It is a high frequency vibration which drifts in frequency between about 3.1 and 3.8 KHz, sliding up and down the spectrum repeatedly over a period of 7 to 10 minutes. It could either be a sonic vibration or a low-frequency radio wave. It is unpredictable, being sometimes there and sometimes not. The CERN engineers have looked for sources of vibration from equipment in the accelerator such as vacuum pumps or the cryogenics, but nothing matches the observed interference and now they are stumped. At this point they must start to consider a more sinister possibility. 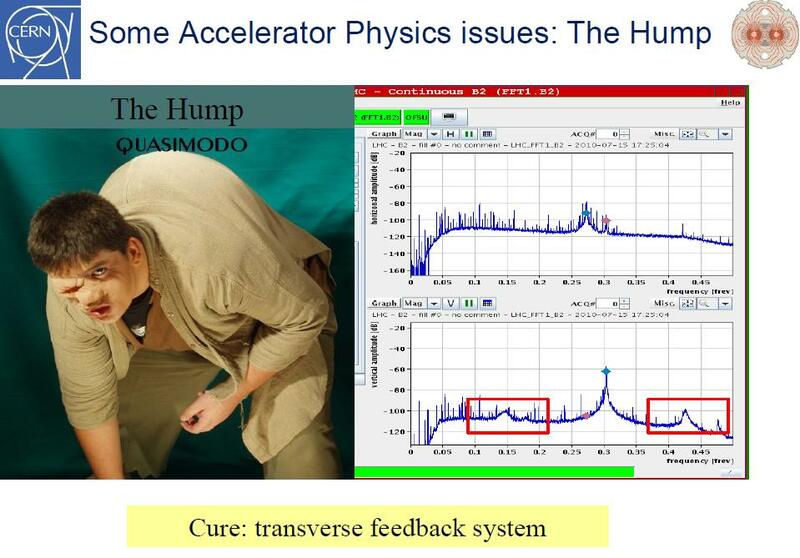 Could The Hump be a deliberate plot to sabotage the LHC? There are plenty of people who would be motivated to attempt such an act. Since its inception the collider has been a source of controversy because a few fringe physicists have suggested that it could create black holes of other unnatural entities that could grow in size to swallow up the Earth. Scientists at CERN have dispelled such theories, pointing out that anything created will fly off at nearly the speed of light and will not be captured by the Earth. Black holes would decay just like any other particle and could not be dangerous, even in the unlikely event that they are created. It has also been pointed out that the kind of particle collisions that the LHC produces are commonly produced in the atmosphere by cosmic rays and would have caused problems long ago if there was any danger. Further studies of particle interactions around neutron stars have eliminated any possibility of catastrophic events beyond any reasonable doubt. This has not satisfied the more hardened detractors who claim that the only people qualified to make such a risk assessment are particle physicists with a self-interest in running the experiment. Some activists have even instigated court cases to try to get the LHC closed down by legal process. With the failure of such initiatives it is certainly not beyond the realms of possibility that some fanaticists would attempt to disrupt the LHC directly. The Hump has especially annoying characteristics. The LHC beam has a tune frequency of around 3.5 KHz which can be modified to avoid most sources of noise, but The Hump varies in frequency, crisscrossing the range in which the tune can be set. If you wanted to design a source of interference to disrupt the accelerator you could do no better than this. If The Hump is caused by a sonic wave or radio wave it must be coming from either directly above or below the collider ring at some point because it is disturbing the beams in the vertical direction. More distant sources would cause horizontal vibrations. Natural causes from below can be ruled out because they would have been seen before. This points to a source of interference coming from above the ring, probably at ground level. It is possible that a sonar device or radio transmitter operating at the observed frequency could be deliberately targeted at the ring from a station or movable vehicle above ground. The LHC scientists are nearly ready to step up the beam intensity so that real physics experiments capable of discovering new phenomena can begin. the saboteurs, if they are really out there, will be waiting for the right moment to throw the collider beams of course, damaging the detectors and making further experiments impossible. Perhaps this is just another conspiracy theory and a benign source for The Hump will be found soon but after several months of searching without result no possibility can be ruled out. You are currently browsing the archives for the The Hump category.